A majority of consumers are willing to pay for a great customer experience according to the 2018 Aspect Consumer Experience Index survey. And while consumers said effectiveness is the single most important aspect of that ideal interaction, this year’s annual survey findings show that catering to engagement preferences and experience-created emotions can be the key to unlocking long-term loyalty and sustained business from customers. Forty-five percent of consumers (and 66% of Boomers) said the most important aspect of a personalized experience is being able to interact with brands on the channel they want – even more important than knowing their name or their transaction history. But consumer expectations vary widely between agent-engaged- and self-assisted interactions. Forty-one percent of consumers who conducted self-service interactions had higher satisfaction expectations compared to doing the same with an agent. But consumers who conducted interactions with agents had a 70% satisfaction expectation compared to conducting the same via self-service. While consumer interest in self-service isn’t declining anytime soon, the personal, human touch still packs a considerable punch when it comes to inspiring customer satisfaction, and ultimately, loyalty. The Aspect Index survey reveals strong proof that agent positivity and commonality of experience play a big part in creating experiences consumers want. For example, 61% of consumers value talking with someone who has gone through the same experience they have more than they care whether the representative is employed in the company’s contact center or if they are a gig/contract worker. And, proving the theory that happy agents equal happy customers, 62% of the respondents said talking or live- chatting with a happy customer service agent would also make them happy. Most consumers (72%) said they would rather interact with a happy agent and have their experience take a little longer than interact with an uninterested agent and have their experience go a little faster. Nearly half (48%) of the consumers surveyed don’t define getting a question answered or a request completed without speaking/chatting with a customer service agent as customer service. However, 38% of the respondents and 50% of Millennials view the option of performing self-service as a natural part of the brand experience and as a positive attribute of the organization. Further, seven-in-ten consumers said the most important component of AI/self-service interaction is being able to seamlessly transfer to a live agent should they desire. In other words, consumers want everything ‒ AI, their choice of channel, and engaging, knowledgeable agents. Currently, Aspect helps enterprises break down the walls between people, processes, systems and data sources, allowing organizations to unite around the customer journey. By developing fully native interaction management, workforce optimization and self-service capabilities within a single customer-engagement center, we enable dynamic, conversational interactions and create a truly frictionless omnichannel customer experience. 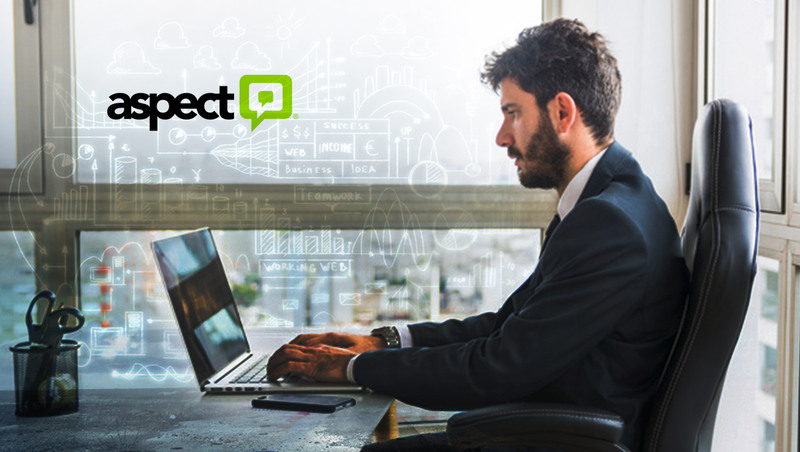 Leveraging the agility of our worldwide cloud infrastructure and over 40 years of industry ingenuity, Aspect conveniently and easily connects questions to answers while helping enterprises keep service levels high and operational costs contained.